Here’s a character kit for a gunslinger, based on Stephen King’s Dark Tower series. Gunslingers are the defenders of the world of light and order, a world that often has left them behind. Originally a kind of knighthood, much like King Arthur’s knights, the gunslingers are unflinchingly devoted to the preservation and defense of the Dark Tower, a black spire that stands at the nexus of all the worlds in the Prime Material Plane, and holds it together. There are ancient forces of chaos and darkness which seek to rule the multiverse. To do so they must destroy the Tower and its aspects throughout the Prime Material, before they can reshape existence in their own image…or not at all. These agents of evil have destroyed whole worlds in their pursuit of their goals. The gunslingers stand in their path, even when the world has moved on and forgotten them. Gunslingers of Gilead are born into the role, raised from early childhood to be respected dispensers of justice, and to wear the guns of their fathers. They learn both extraordinary martial prowess and deep devotion to their cause. Gilead gunslingers tend to be lawful good. However, gunslingers may come from all walks of life and any race. Non-Gilead gunslingers must be lawful, good, or both. They may not be evil. The Tower is everything. 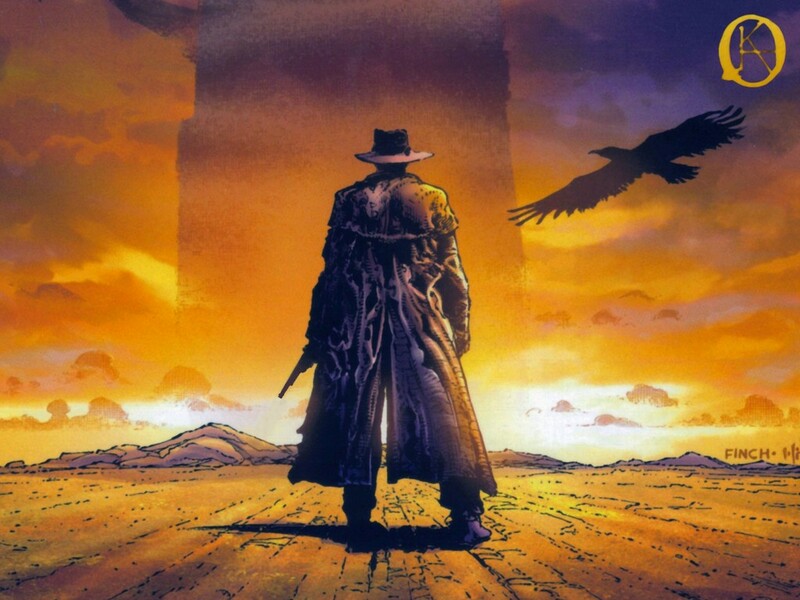 All things serve the Tower, goes the old gunslinger adage, and they will sacrifice anything- or anyone- to defend it. Gunslingers may have to commit terrible acts, acts they know will damn them. Still, they soldier on, determined to stay alive through even the harshest conditions. For the Tower, they will pay any price, and will travel across worlds to defend it. Most gunslingers pick a weapon at an early age and train with it, treating it as an extension of their soul. This intensive, almost religious training gives them +2 with pistols and rifles, and -1 to their initiative in combat, for every 3 XP levels. Usually these are ancestral six-shooters (d6 dmg, see six-shooter rules below), forged long ago from the swords of their ancestors. However, gunslingers are nothing if not practical survivalists, and they seek perfection with any weapon. He must specialize in a missile weapon (pistol, rifle, bow, sling, blowgun), but in a style of his choosing. Gunslingers are automatically proficient with any missile weapon. A gunslinger may become proficient in a melee weapon for secondary weapon, but only those of Small size (ex: dagger, whip, hand pick, hand axe, etc.). If someone becomes a gunslinger, usually it is because the Tower wills it. In service of this strange calling, they are often blessed (or cursed) with a wild psionic talent (DM’s discretion). This talent becomes apparent once the gunslinger finishes his training, as the martial awareness he develops enhances other parts of his mind. Many who train to be gunslingers fail the final test of their training, usually a quest or single combat against their teacher. For their failure, they are banished and live out the rest of their lives in shame. Six-shooters are revolvers which (duh!) must be reloaded every six shots. PCs proficient in six shooters get 1 shot per round (per pistol; double weapon penalties apply). Specialists get 3/2. Every shot beyond this incurs a -2 cumulative penalty to hit. Technically, a gunslinger could fire all six shots in a round, but probably would not hit much. In the heat of battle, reloading takes cool nerves and precision. It also takes time. For a non-proficient player, reloading takes one round per bullet. For specialists, six bullets can be reloaded in one round. Special abilities: Once per day, the gunslinger can choose to concentrate for one round, making no attacks. For the next 2 rounds, he can hit targets which normally require a magical weapon. His attacks are treated as magical attacks. 6th level: 2 initiative in combat. 7th level: The gunslinger may form a ka-tet, a clan of three or more gunslingers bound by a common destiny. The kat-tet, when complete, can detect evil within 30 yards and pools psionic points for any psionic ability. The gunslinger may also train other PCs or NPCs to be gunslingers. 9th level: 3 initiative in combat. The gunslinger also gains the psionic ability to travel astrally in dreams. 12th level: 4 initiative in combat. Once per week, the gunslinger may open a gate to any plane he has been to before, even if only in a dream. 1) When a gunslinger commits an act against the Tower or fails to defend its interests, for whatever reason, he loses all experience points beyond his current level. PSPs are cut in half. He also loses any special abilities related to his kit and is plagued by horrific nightmares until he redeems himself. Basically he doesn’t get to sleep until he rights what is wrong. This means he begins to go insane, gaining one insanity point for each 3 days without sleep. 2) Whenever a gunslinger violates his alignment in service to the Tower, he gains an insanity point. Each violation adds 5% to the chance of insanity. Every six insanity points, and at each level, the gunslinger rolls for insanity, then on the 1st Ed. insanity table. A gunslinger may gradually build up a whole host of mental problems. When a character goes through a whole level without committing an act against their alignment, one mental affliction is cured, and 5% is subtracted from the insanity risk. Bullet casting (Int -2; 3 nwpn proficiency slots): This is similar to weaponsmithing, but is the skill of crafting ammunition for firearms. A character with this nonweapon proficiency can create a cast with which to make shells, and can manufacture gun powder if the proper materials are available (It is left to the DM’s discretion to determine what materials will suffice). The character declares beforehand what kind of bullet they want to make (six-shooter, shotgun, etc.) Each time a cast is made, the character makes a -2 Intelligence check to create a mold for the right caliber bullet. An additional check is required to create gunpowder. If the check for gunpowder fails, the bullets may misfire, or there could be a terrible explosion, or any number of calamities (DM’s discretion). Each mold can be used to create 4d6 bullets. This process takes three days, and only one check may be made each day. Runecasting (Wis -2, 2 nwpn proficiency slots) (Prerequisite, Bullet casting): With this skill a character can create d6 bullets capable of harming creatures normally only hit by magic. For each level of this proficiency, a character can confer a +1 attack bonus to his bullets. A successful Bullet Casting check must be made before making a Runecasting check, and these bullets take a full day to create. This proficiency may not be taken before third level. These special bullets, which must be made of a high quality material (silver, gold, mithril, ruby, etc. ), are capable of holding magical charges. These shells may be imbued with magic spells of up to two times the level of Runecasting proficiency used. Thus, a character with 2 levels of Runecasting could imbue d6 bullets with a single spell of up to 4th level. The character must have a scroll of the spell in question, and must fast for three days before undertaking the Runecasting process. The scroll is consumed in the casting.